The Fallkniven TK2l continues to build upon the experience of the fabled Swedish knife brand with its Tre Kronor series. The TK2 is truly a knife to be reckoned with since if one were to consider just the price and the knife’s performance, then this would really be the winner hands down. It comes with a powerful blade made from the laminated powder steel for which Fallkniven is now famous and when you combine this with the secure and really comfortable grip of the knife’s handle you really come up with a package that is truly unparalleled at the moment as far as knives are concerned. The knife is a utility knife which can be relied on for all sorts of tasks and in all sorts of situations and which will perform at the top of its ability as long as you allow it to. The TK2 is another knife from the fabled Tre Kronor series which offer a top technological solution which is combined with the Swedish design that goes back hundreds of years. The knife’s blade is a result of a detailed and painstaking process of development which results in a 3G steel blade that is sintered and anti-corrosive to ensure top quality performance. The minimalist idiom is characteristic of this series and one can note that form really meets function in the TK2. 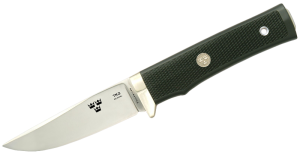 Apart from the hardness, the TK”’s blade also retains an edge very well indeed and can be described as an easy and highly accommodating knife – a true world beater from the land of the swedes. The TK2 also comes with a fine black leather sheath and with its Thermorun handle, it ensures fantastic grip and maximum functionality in all sorts of situations.